German ambassador these days was Hugo Julius Raoul Eduard Leszczyc Fürst von Radolin, who had his residence in St.Petersburg. Since 1901 he was ambassador in Paris and before his post in St.Petersburg he was ambassador in Constantinople.His diplomatic achievements were rather limited. He had to be withdrawn from Russia because he had a dispute with the Czarina. In Paris, he tried in vain for a Franco-German approach. He came from the old Polish nobility of Radolin. His father was the Prussian chamberlain and member of the manor house Emmerich Ladislaus Leszczyc Count of Radolin-Radolinski (1808-1879), lord on Jarotschin and Radolin. He married 1863 in London Lucy Katharina (1841-1880) a daughter of lieutenant colonel Alfred Howard Wakefield. After the death of his first wife, Radolin married Johanna (1864-1947) in 1892. This was the daughter of Hans Count von Oppersdorff and his wife Elisabeth (born de Talleyrand-Perigord). 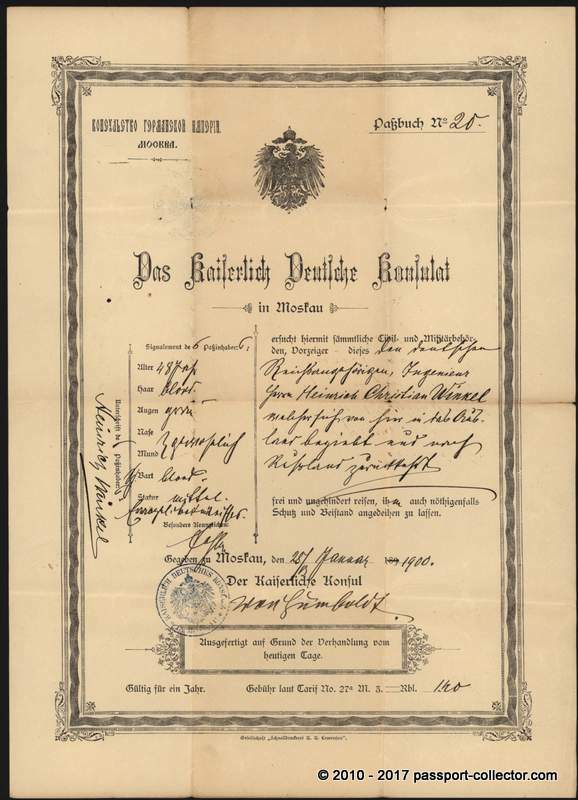 The passport was signed by consul “von Humboldt”, his full name was Hans Paul Wilhelm Alexander Freiherr von Humboldt-Dachroeden. Hans Paul von Humboldt-Dachroeden was the son of Wilhelm von Humboldt-Dachroeden (1823-1867) (the grandson of the famous scholar and statesman Wilhelm von Humboldt) and his wife Hermine von Werder (1830-1903). Hans Paul von Humboldt-Dachroeden studied law at the University of Göttingen. In 1877 he became a member of the Corps Saxonia Göttingen. On July 21, 1885, he married Elsbeth Schmidt († 1953). The couple had two daughters and one son. After completing the Assessorexamen in 1886, he took up the diplomatic career at the Foreign Office. In 1887 he became vice-consul in London, consul in Moscow in 1893, consul in Alexandria in 1901, consul general in consul in 1905, and deputy consul general in Amsterdam in 1915. From 1920 to 1923 was from Humboldt-Dachroeden German ambassador in Lima. He died 1940 in Germany. Richthofen is the surname of a prominent German aristocratic family. The most famous member is the air ace Manfred von Richthofen (1892–1918), also known as the “Red Baron”, but a number of other members of his family are also notable for various reasons. Some members of the family have a royal ancestry as descendants of the older of two illegitimate sons of Leopold I, Prince of Anhalt-Dessau, by Sophie Eleonore Sölden. ← Should you frame a historical passport and if so, how?